The Bureau of Labor Statistics announced that the visitors to their website are most likely to be searching for information about jobs that are projected to become increasingly in demand within the next decade. The BLS provides data that points to an enormous increase in work that is familiar to many people. These are not tech-savvy jobs or green economy jobs that seem to gain a lot of press, but rather, they are jobs you might have learned about in kindergarten as part of your training about the people in your neighborhood. Projected to increase over the 2008–2018 period is the number of registered nurses. By 2018, the statistics project 581,500 more registered nurses, an increase of 22 percent. The number of teachers is projected to increase by 468,000 (an increase of 13 percent). Accountants and auditors are projected to increase by 279,400 (a 22 percent increase). 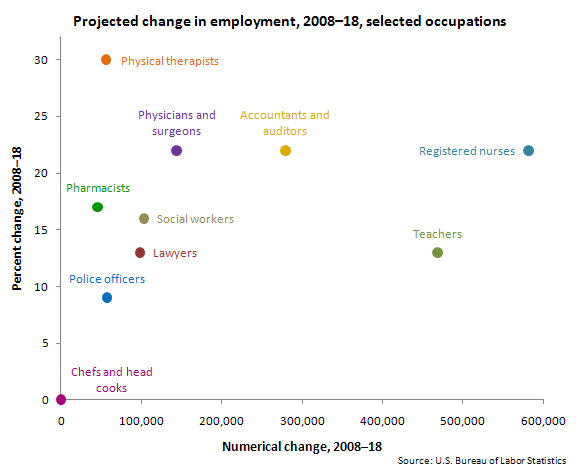 Meanwhile, the BLS predicts the largest change in the number of physical therapists. Does this mean that the BLS is predicting Americans will be more likely to harm themselves in the next decade? Or does it simply mean that more people will recognize the worth of getting physical therapy when their bodies are in pain? Hopefully, the figures suggest that more people will be receiving medical attention. Finally, it appears that there will be little change in the numbers of cooks and chefs by 2018. Are there enough cooks already to satisfy the hungry masses? Is there a static amount of willingness to pay for someone else to prepare your food? Below is a graph by the Bureau of Labor Statistics, predicting the future through their record-keeping.